On Tuesday, a squadron from Russia’s Pacific Fleet arrived in Cambodia for what officials termed an unofficial visit. The engagement brought into focus both the defense ties between the two countries as well as Moscow’s role in Southeast Asia more broadly. Russian ship visits around the region in general and in Cambodia in particular are nothing new. Russia and Cambodia have had diplomatic relations for decades. The defense side of ties had been slower to develop, relatively speaking. That said, there have been a number exchanges, dialogues, and visits, including ship visits. Indeed, in April last year, the Russian Pacific Fleet paid a four-day visit to Sihanoukville Autonomous Port at Preah Sihanouk province. Of late, however, such ship visits have been given a higher profile by Moscow and, to a degree, by regional states. As I have noted before, the ship visits around the region are part of a broader trend underway in the region where Russia under Vladimir Putin – ambitious abroad and increasingly isolated from the West — has been looking to boost its presence in the Asia-Pacific, including in Southeast Asia, over the past few years (See: “What’s in the New Russia-Thailand Military Pact?”). Some Southeast Asian states have been more receptive than others as they seek to diversify their ties as well. This is despite the significant challenges Moscow faces in actually doing so, including in the defense domain. In just the past month alone, Russian Pacific Fleet ships have been making stops around the region, including in Brunei last month for the Golden Jubilee celebration of Sultan Hassanal Bolkiah’s accession to the throne – reported as the first visit in more than a quarter-century – and a stop in the Philippines where there was a turnover of Russian weapons and Philippine officials, including President Rodrigo Duterte, boarded the Admiral Panteleyev (See: “Russia-Philippines Military Ties Get an October Boost”). On November 7, in yet another manifestation of this broader trend, a Pacific Fleet squadron consisting of the Admiral Panteleyev, a large anti-submarine ship, and Boris Butoma, a large sea tanker, arrived in Cambodia. Russian news agency TASS quoted Pacific Fleet spokesman Nikolay Voskresensky as saying that the schedule for the Cambodia visit, which would last till November 12, would include interactions between Russian ship commanders and Cambodian officials – including the port’s director general, Preah Sihanouk Province governor, Sihanoukville city mayor and the Ream Naval Base commander – as well as other community engagements between the two sides such as sports events and bus tours for Pacific Fleet sailors across some tourist spots. The schedule is consistent with previous such visits that Russian ships have made to Cambodia. While the ships are in Cambodia, they will reportedly be open to visits from personnel from the Royal Cambodian Armed Forces as well as locals (previous visits have occasionally seen Cambodian defense officials also make an appearance). Russia’s ambassador to Cambodia, Dmitry Tsvetkov, was also scheduled to visit the ships as well. A closer look at the broader context behind a recent interaction between the two sides. 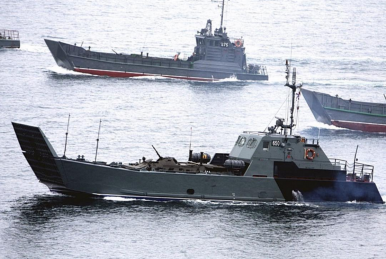 Russia-Thailand Military Ties in Focus With Helicopter DisplayWhat’s in the New Russia Navy Visit to the Philippines?What’s With the New Russia-Vietnam Truck Deal?Russia Bomber Flight Over Indonesia Highlights Defense TiesWhere Are Russia-Philippines Defense Ties Under Duterte?